Inventory is something to watch carefully as there are rumors that banks are beginning to unload their inventory in large numbers in order to raise cash. 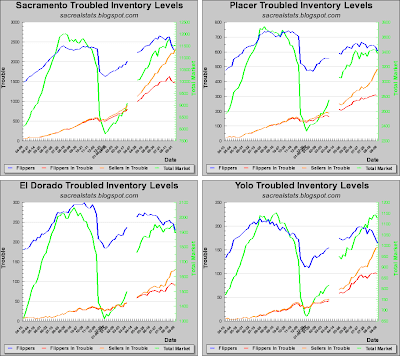 The inventory and stress indicators should tell us if/when that process accelerates. 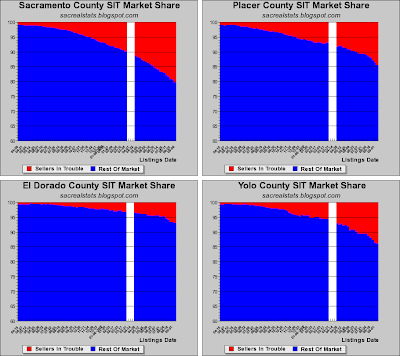 All in all, the real estate market in Sacramento is under stress, and conditions are changing rapidly. Watch this space for updates as they come in. My guess is that you are seeing fits/sits drop as they're foreclosed upon or signed over to the lenders (then their new "price" you are tracking is the 1st loan amount) - not some sudden improvement. Ugly. Wonder which price ranges concentrated - not really, likely 300-500K. 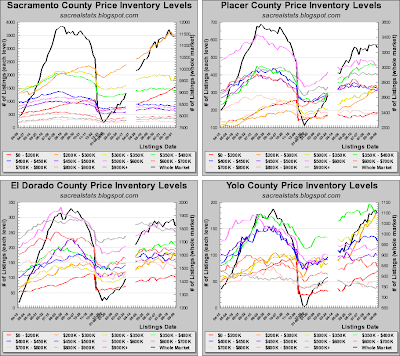 Also wonder why Foreclosures.com and Realty Trac numbers vary from each other so much and nobody questions, not even the paid media (Sac Bee). I know you guys have regular jobs. "There are rumors that banks are beginning to unload their inventory in large numbers in order to raise cash." I think the banks unloading their inventory must have started. 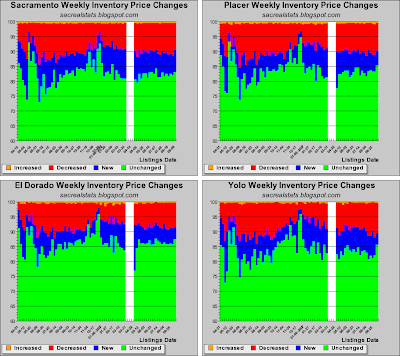 I was looking over some home in Roseville and Rocklin area over the weekend and I was surprised to see big drop in prices. What surprised me was not the amount that dropped (over 100k in some cases) but the Rate of drop. 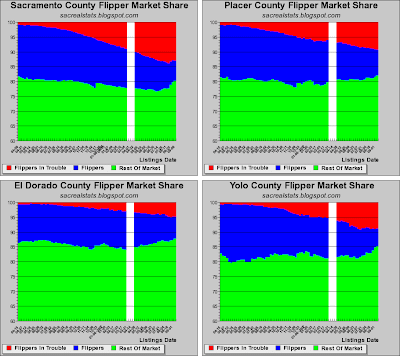 Many homes had prices that were being cut every 2-3 weeks at 20-30k or more. Only thing I can deduce from the rapid rate of price cuts is that Banks are now aggressively selling the home to get them off the books. Mike, buy when it works for you, but consider we still have rising inventory, rising foreclosures, tightening credit, dropping prices and lower sales volume. Until those factors change, anything you purchase now will be worth substantially less tomorrow. 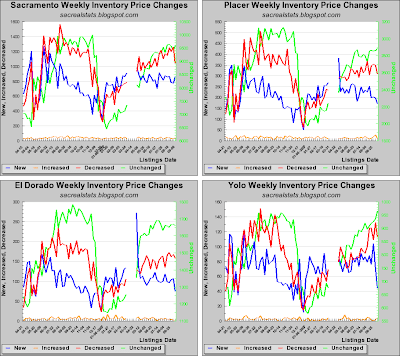 Housing Tracker suggests inventory has reached its seasonal high. 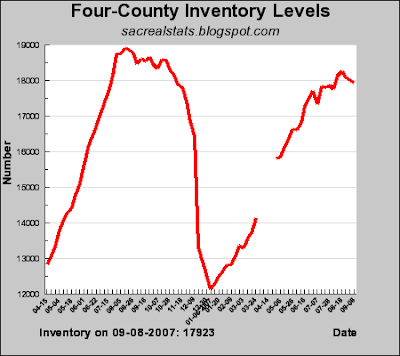 What will be interesting this winter is to see how low the for sale inventory drops. I suggest, with all the vacant and REO inventory, we will stay at record high levels for winter numbers. Spring will be interesting. Also, Housing Tracker suggest asking prices are dropping 2% each month now. That means a $400,000 house is worth $8,000 less next month. I can be very patient for $8,000/mon. I am noticing the new home builders getting a dose of reality. 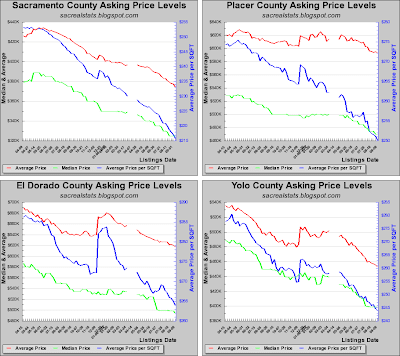 Yesterday (9/10/2007) Pulte Homes has dropped their asking prices by an average of 10% in El Dorado Hills. The price per sq ft for a new home is listed at $172. But, be careful what you wish for ... this seems to be setting up far catching of falling knives. I'm not going to look until prices are on an upswing. I think Realty trac may be counting each property 3 times. once each for outstanding amounts due such as 1st mortgage, 2nd, and taxes.